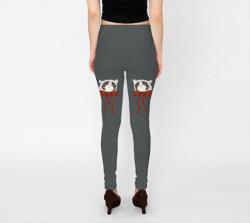 Wearable, custom made art on leggings. This art piece is painted and designed by my wife jenny steward and printing/production is done by artofwhere. Small -- waist 25", hips 36", inseam 28.5. Medium -- waist 28", hips 39", inseam 29. Large -- waist 33", hips 42", inseam 29.5. (for in-between measurements, please choose the smaller size). The leggings are cut to be high waisted and give that nice squeeze on your belly. The elastic waistband will rest at about 1-2 inches below your belly button. If you are unsure of where your natural waistline is, just measure around at the height of your belly button. To measure your hips, measure the widest part around your thighs. To measure your inseam, start at your ankle and measure up the inside of your leg to the crotch. Don't worry if your inseam varies from the chart measurements. The legging fabric allows for some stretching or scrunching up around the ankle to fit different lengths. -made from ultra-stretch polyspandex blend fabric that won't lose shape even after multiple wearings. -vivid print that won't fade after washing. -easy care: machine wash cold. Tumble dry on regular or hang to dry. -cover-stitched waist band and hems. -printed and sewn by hand in montreal canada. - fabric is manufactured in canada and contains 88% polyester 12%dex. All leggings are made to order. I try to do my best to ensure that the color of each item is accurately displayed but colors can be slightly different on each computer screen due to monitor settings.